The First Step to Recovery Is Always the Hardest. 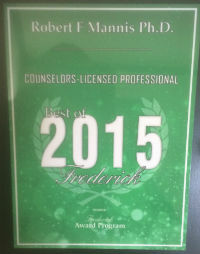 Reach out to one of Frederick, MD’s premier psychologists. Everyone faces their own unique challenges—why suffer in silence when support is just a phone call away? Dr. Robert F. Mannis provides assistance to local residents struggling with emotional distress of all types. He knows that there is no one-size-fits-all treatment for mental health issues. That’s why he’ll tailor your therapy to meet your unique needs. Dr. Mannis focuses on changing your perspective and behaviors through cognitive behavioral therapy. He will pinpoint the source of your distress and identify the emotional triggers causing that distress. From there he’ll come up with a plan of action to help you take control of your emotions and combat those feelings of distress. See what Dr. Robert F. Mannis can do to help by calling 301-662-4160. Dr. Robert F. Mannis can treat what is ailing you. Whether you’re suffering from emotional distress or trying to cope with a difficult life situation, you’ll get expert help from this specialist. Schedule an appointment with Dr. Mannis. Anxiety and depression can sometimes leave you feeling lonely and alienated from your own life. Dr. Mannis can help to alleviate some of the pain you’re suffering through his counseling services. He strives to provide a safe environment in which you can explore your feelings of emotional distress without judgment. He will help you work through your emotions to find the source of your pain and develop counter measures to help you cope successfully with life and it's challenges. Learn more about his counseling services by reaching out to Dr. Robert F. Mannis. Copyright © 2019 Dr. Robert F. Mannis, all rights reserved.